Crinkle cookies look pretty but can they taste better? 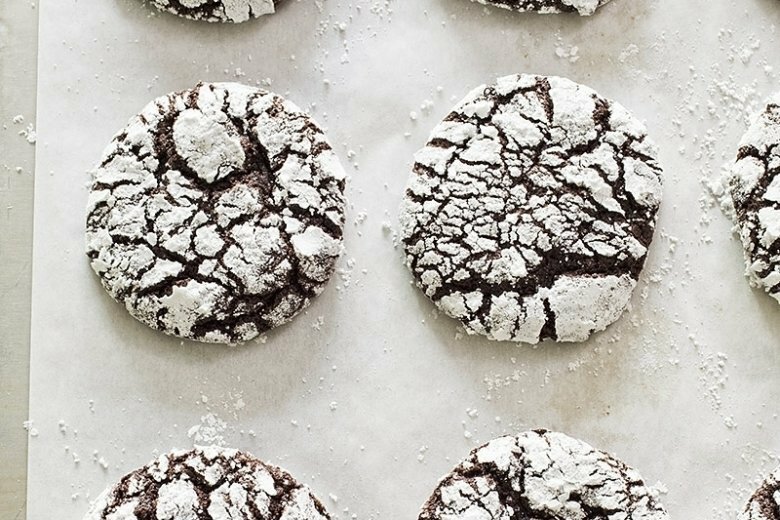 Rolled in powdered sugar before baking, chocolate crinkle cookies (often called earthquakes) feature chocolaty fissures that break through the bright white surface during baking. While striking in appearance, these cookies often fall short on taste. Using a combination of cocoa powder and unsweetened bar chocolate rather than bittersweet chocolate (which contains sugar) certainly upped the intensity, and swapping brown sugar for the granulated created a complex sweetness. At this point, the cookies had deep, rich flavor, but the exterior cracks were too few and too wide, and the cookies weren’t spreading enough. Using a combination of baking soda and baking powder helped_the bubbles produced by the leaveners rose to the surface and burst, leaving fissures_but the cracks gapped. We had been refrigerating this fluid dough overnight before portioning and baking the cookies, but the cold dough didn’t begin to spread very much until after that dried exterior had formed, forcing the cracks to open wide. The solution was to bake the cookies after letting the dough sit at room temperature for 10 minutes, which was just enough time for the dough to firm up to a scoopable consistency. Adjust oven rack to middle position and heat oven to 325 F. Line two baking sheets with parchment paper. Whisk flour, cocoa, baking powder, baking soda, and salt together in bowl. Whisk brown sugar; eggs; espresso powder, if using; and vanilla together in large bowl. Microwave chocolate and butter in bowl at 50 percent power, stirring occasionally, until melted, 2 to 3 minutes. Whisk chocolate mixture into egg mixture until combined. Fold in flour mixture until no dry streaks remain. Let dough sit at room temperature for 10 minutes. Spread granulated sugar in shallow dish. Spread confectioners’ sugar in second shallow dish. Working in batches, drop 2-tablespoon mounds of dough (or use #30 scoop) directly into granulated sugar and roll to coat. Transfer dough balls to confectioners’ sugar and roll to coat; space dough balls evenly on prepared sheets, 11 per sheet. Bake cookies, 1 sheet at a time, until they are puffed and cracked and edges have begun to set but centers are still soft (cookies will look raw between cracks and seem underdone), about 12 minutes, rotating sheet halfway through baking. Let cookies cool on sheet for 5 minutes, then transfer to wire rack. Let cookies cool completely before serving. Nutrition information per serving: 165 calories; 50 calories from fat; 6 g fat (3 g saturated; 0 g trans fats); 35 mg cholesterol; 103 mg sodium; 29 g carbohydrate; 2 g fiber; 22 g sugar; 3 g protein.